A gurdwara (gurdwārā; meaning "door to the guru") is a place of assembly and worship for Sikhs. People from all faiths, and those who do not profess any faith, are welcomed in Sikh gurdwaras. Each gurdwara has a Darbar Sahib where the current and everlasting guru of the Sikhs, the scripture Guru Granth Sahib, is placed on a takhat (an elevated throne) in a prominent central position. The raagis (who sing Ragas) recite, sing and explain, the verses from the Guru Granth Sahib, in the presence of the congregation. All gurdwaras have a langar hall, where people can eat free vegetarian food served by volunteers at the gurdwara. They may also have a medical facility room, library, nursery, classroom, meeting rooms, playground, sports ground, a gift shop, and finally a repair shop. 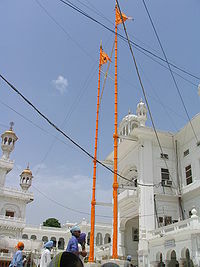 A gurdwara can be identified from a distance by tall flagpoles bearing the Nishan Sahib, the Sikh flag. The Harmandir Sahib in Amritsar, India, known informally as the Golden Temple, is the holiest gurdwara of Sikhism. 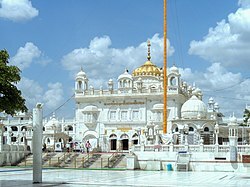 The most well-known gurdwaras are in the Darbar Sahib complex in Amritsar, Punjab  including Darbar Sahib, the spiritual center of the Sikhs and Akal Takht, the political center of the Sikhs. The first gurdwara was built in Kartarpur, on the banks of Ravi River in the Punjab region by the first Sikh guru, Guru Nanak Dev in the year 1521. It now lies in the Narowal District of west Punjab (Pakistan). The worship centres were built as a place where Sikhs could gather to hear the guru give spiritual discourse and sing religious hymns in the praise of Waheguru. As the Sikh population continued to grow, Guru Hargobind, the sixth Sikh guru, introduced the word gurdwara. The etymology of the term 'gurdwara' is from the words 'gur (ਗੁਰ)' (a reference to the Sikh gurus) and 'dwara (ਦੁਆਰਾ)' (gateway in Gurmukhi), together meaning 'the gateway through which the guru could be reached'. Thereafter, all Sikh places of worship came to be known as gurdwaras. Khadur Sahib, established in 1539 by the second Sikh Guru, Guru Angad Dev ji, near River Beas, Amritsar District, Punjab, India. Goindwal Sahib, established in 1552 by the third Sikh Guru, Guru Amar Das ji, near River Beas, Amritsar District Punjab, India. Sri Amritsar, established in 1577 By the fourth Sikh Guru, Guru Ram Das ji, District Amritsar, Punjab India. Tarn Taran Sahib, established in 1590 by the fifth Sikh Guru, [Guru Arjan Dev ji], District Tarn Taran Sahib, Punjab India. Kartarpur Sahib, established in 1594 by the fifth Sikh Guru, Guru Arjan Dev, near river Beas, Jalandhar District, Punjab India. Sri Hargobindpur, established by the fifth Sikh Guru, Guru Arjan Dev, near river Beas, Gurdaspur District, Punjab India. By the early 20th century, a number of Sikh gurdwaras in British India were under the control of the Udasi mahants (clergymen). The Gurdwara Reform Movement of the 1920s resulted in Shiromani Gurdwara Parbandhak Committee taking control of these gurdwaras. The Panj Takht which literally means five seats or thrones of authority, are five gurdwaras which have a very special significance for the Sikh community. They are result of the historical growth of the religion of Sikhism and represent the centers of power of the religion. Takht Sri Hazur Sahib, located on banks of the River Godavari in Nanded, Maharashtra, India. Shabad Kirtan: singing hymns from the Granth Sahib. 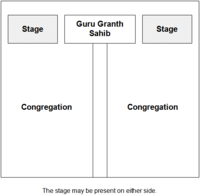 Strictly speaking only Shabads from Guru Granth Sahib, Dasam Granth, and the compositions of Bhai Gurdas and Bhai Nand Lal, can be performed within a gurdwara. Paath: religious discourse and reading of Gurbani from the Guru Granth Sahib, with its explanations. There are two types of discourse: Akhand Paath and Sadharan Paath. Sangat and Pangat: providing a free community kitchen called a langar for all visitors, regardless of religious, regional, cultural, racial, caste, or class affiliations. Other ceremonies performed there include the Sikh marriage ceremony, Anand Karaj; some of the rites of the death ceremony, Antam Sanskar; and most of the important Sikh Festivals. The Nagar Kirtan, a Sikh processional singing of holy hymns throughout a community, begin and conclude at a gurdwara. Gurdwaras around the world may also serve the Sikh community in other ways, including acting as libraries of Sikh literature and schools to teach children Gurmukhi, housing the Sikh scriptures, and organizing charitable work in the wider community on behalf of Sikhs. Many historical gurdwaras associated with the lives of the Sikh Gurus have a sarovar (eco-friendly pool) attached for bathing. Gurdwaras have no idols, statues, or religious pictures. Instructional video on what to expect on a visit to a Sikh Gurdwara, by Sikh Dharma International. In the langar room, food is cooked and served by the volunteers in the community. Only vegetarian food is served in the langar hall, to suit the visitors from different backgrounds so that no person may be offended. All people belonging to different faiths sit together to share a common meal, regardless of any dietary restrictions. The main philosophy behind the langar is two-fold : to provide training to engage in seva and an opportunity to serve people from all walks of life, and to help banish all distinctions between high and low or rich and poor. Guru Nanak Gurdwara Smethwick in Sandwell, one of the first and largest gurdwaras in the UK. Gurdwara buildings do not have to conform to any set architectural design. The only established requirements are: the installation of the Granth Sahib under a canopy or in a canopied seat, usually on a platform higher than the specific floor on which the devotees sit, and a tall Sikh pennant flag atop the building. In the 21st century, more and more gurdwaras (especially within India) have been following the Harimandir Sahib pattern, a synthesis of Indo-Islamic and Sikh architecture. Most of them have square halls, stand on a higher plinth, have entrances on all four sides, and have square or octagonal domed sanctums usually in the middle. During recent decades, to meet the requirements of larger gatherings, bigger and better ventilated assembly halls, with the sanctum at one end, have become accepted style. The location of the sanctum, more often than not, is such as to allow space for circumambulation. Sometimes, to augment the space, verandahs are built to skirt the hall. A popular model for the dome is the ribbed lotus, topped by an ornamental pinnacle. Arched copings, kiosks and solid domelets are used for exterior decorations. Shabad Kirtan is performed daily in gurdwaras around the world by Sikh Ragis. It is the duty of all Sikhs to engage in personal and communal meditation, Kirtan and the study of the holy Scriptures. Meditating and understanding the meaning of texts from the Granth Sahib is important for the proper moral and spiritual development of a Sikh. One must study Gurmukhi script and be able to read Gurbani to understand the meaning of the text. A Sikh has to revert to the Granth Sahib for the all spiritual guidance in one's life. It is believed that a Sikh is more easily and deeply engrossed by Gurbani when engaged in congregation gatherings. For this reason, it is necessary for a Sikh to visit gurdwara. On joining the holy congregation, Sikhs should take part and obtain the benefit from the combined study of the holy scriptures. No one is to be barred from entering a gurdwara regardless of their religious or regional background and are welcomed in. Seva is an important and prominent part of the Sikh religion. Dasvand forms a central part of Sikh belief (of Vand Chhako) and literally means donating ten percent of one's harvest, both financial and in the form of time and service such as seva to the gurdwara and anywhere where help is needed. All Sikhs therefore get involved in this communal service whenever an opportunity arises. This in its simple forms can be: sweeping and washing the floors of the gurdwara, serving water and food (Langar) to or fanning the congregation, offering provisions or preparing food and doing other 'house keeping' duties. Sikhism offers strong support for a healthy communal life, and a Sikh must undertake to support all worthy projects which would benefit the larger community and promote Sikh principles. Importance is given to Inter-faith dialogue, support for the poor and weak; better community understanding and co-operation. Many gurdwaras also have other facilities for Sikhs to learn more about their religion, such as libraries, complexes for courses in Gurmukhi, Sikhism and Sikh scriptures, meeting rooms, and room-and-board accommodation for those who need it. Gurdwaras are open to all people - regardless of gender, age, sexuality or religion - and are generally open all hours of a day. Some gurdwaras also provide temporary accommodations (serais) for visitors or devotees. The gurdwara also serves as a community centre and a guest house for travellers, occasionally a clinic, and a base for local charitable activities. Apart from morning and evening services, the gurdwaras hold special congregations to mark important anniversaries on the Sikh calendar. They become scenes of much éclat and festivity during celebrations in honour of the birth and death (Joythi Joyth Samaey) anniversaries of the Gurus and Vaisakhi. ^ "The Gurdwara". BBC.co.uk. BBC. Retrieved 18 March 2013. ^ "Gurdwara Requirements". WorldGurudwaras.com. Archived from the original on 4 October 2013. Retrieved 18 March 2013. ^ a b c The Editors of Encyclopaedia Britannica 2014. ^ a b c "Historical Gurdwaras" Archived 2010-06-11 at the Wayback Machine, Shiromani Gurdwara Parbandhak Committee, Amritsar, Punjab, India, www.SGPC.net, 2005. ^ H. S Singha (2000). The encyclopedia of Sikhism. Hemkunt Press. p. 13. ISBN 978-81-7010-301-1. ^ Rajit K. Mazumder (2003). The Indian army and the making of Punjab. Orient Blackswan. pp. 213–218. ISBN 978-81-7824-059-6. ^ "Special train to connect all five Takhats, first run on February 16". ^ W. H. McLeod (2009). The A to Z of Sikhism. Scarecrow. p. 16. ISBN 978-0-8108-6344-6. ^ "Railways halts survey to finalise the Talwandi Sabo rail route". hindustantimes.com. 25 August 2015. Retrieved 7 October 2015. ^ "BBC - Religions - Sikhism: The Gurdwara", BBC.co.uk, 2010. ^ "BBC - Religions - Sikhism: Weddings", BBC.co.uk, 2010.